There’s no doubt about it: the TOEFL is expensive, difficult, and time-consuming. If you’re intending to go to university at an English-instruction school, it can be one of the greatest expenses you will incur in applying. However, you can waive the fee and even the need for the test if you qualify. To do either thing, you will have to write a letter. On this page, we will teach you how to write a good one that will ensure your waiver is granted. The TOEFL measures your ability to speak English as a foreign language at a university level. To study at this level, you need to demonstrate that you have an advanced or even expert command of English. People who need to take the TOEFL include university students at English-speaking universities whose first language isn’t English, English learning program students, scholarship and certification candidates, learners who want to track their projects, and people applying for visas. So how can you avoid the rush and write a good waiver letter using a TOEFL waiver request letter sample? A TOEFL waiver is a type of English waiver letter sample where you request an institution or college a TOEFL waiver. It should be well-written and persuasive, and since you are writing to proof your English level, it cannot contain any grammar, spelling or punctuation mistakes. 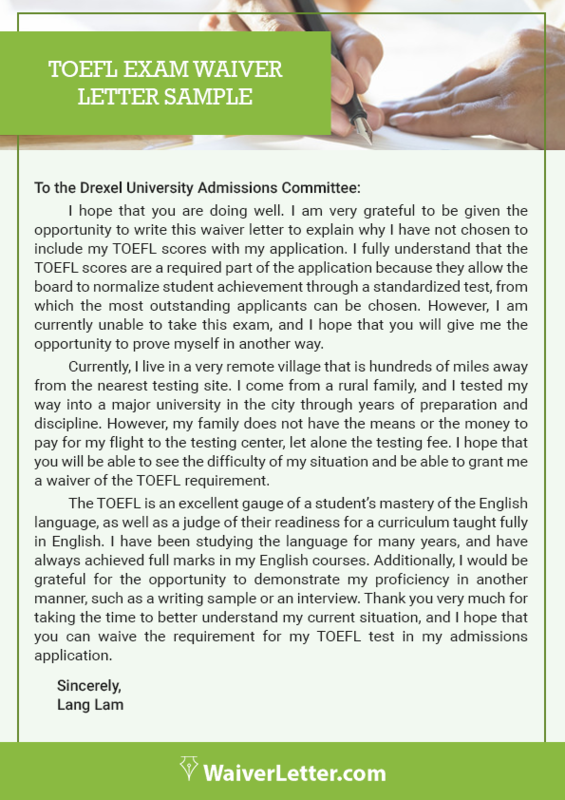 You may need to write a TOEFL waiver letter for different circumstances. If you are applying to enroll in a course at an English speaking country and you are a non-native English speaker, the college will ask you to present your TOEFL® score. If you do not want to take the test because you have a high level of English, you can write a letter asking them for a waiver. Another reason why you may need it is if you want a particular job at an English country and, again, you are a non-native English speaker. In this case, you can write a waiver letter to the company where you state that you are proficient in English along with substantial evidence to corroborate your argument. List the date, then skip two lines. Write the name and recipient address. Write the greeting two lines below this. Go down to the next line, and write your introduction. Explain who you are and a bit about your circumstances. Add a body of one or two paragraphs with supporting evidence as to why you should be exempt. Skip two lines, and add your closing (Regards, sincerely, etc). Type your name four lines below, then print the letter and sign it in the empty space. 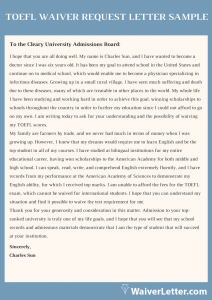 Writing a TOEFL waiver letter can be tricky. Because you are writing to say that you are proficient in English, you will have to deliver a well-written letter. To ensure you do it, you should watch for some things when writing your letter – you can read an English language waiver sample to see the final result. As a general rule, you should pay extra attention to the language you use. As a non-native English speaker, you should be careful not to use slang or any other jargon that may seem too rude for the reader. Instead, write your letter using formal language. You should always respect the reader and making sure you use the right words is one way to do it. Another thing you should watch for is the format you use. A waiver letter should be brief, but it should include all the important information to help the reader decide if they grant you your request or not. Follow a basic structure of four paragraphs and acknowledge the reader at the end of your letter. You should also pay attention to your grammar and spelling. Revise your letter after you finish writing it to make sure there are no mistakes left. This will demonstrate the reader that you take care of the little details, and you will take your time to ensure your writing is spotless. These tips will help you write a much better letter, whatever it be, for instance, CLEP fee waiver. While we can’t guarantee that your letter will be a success, we promise they will make it shine. Be concise: Don’t give too much information. But be complete: Still, you don’t want to tell an unfinished story; be sure you completely explain the relevant circumstances. Describe why you are writing a waiver letter. You should elaborate a little bit more than just saying “ I am writing to ask for a TOEFL waiver”. Make sure you briefly explain why you are writing the letter. Find out names: It makes a much better impression if you address the letter ‘Dear [name of the person you’re writing to]’ rather than ‘To whom it may concern’. It shows you’ve been thoughtful and taken the time to figure out who you’re writing to. Do not forget to explain your academic background and career experience. This will help you to convince the reader about your English level. Say thank you: During your body, thank the reader for their time. It is polite. Include any evidence that can help you prove your point. This can be hard copies from your certificates or names and dates from courses you have taken or the jobs you have done. Ensure you use formal language. Do not write your letter using slang. However, make sure you write catchy and persuasive sentences. After all, you want to convince the reader to grant you a waiver. Proofread: Get a native speaker to check your work. You don’t want to make an error that makes them rethink your suitability. TOEFL letter format like pardon letter format has several elements: first paragraph, second paragraph, body and the conclusion. Also feel free to check out all tricks for writing GRE waiver letter! Our expert writers give you some additional advice for your TOEFL waiver letter. If you have to write a waiver letter, the best thing to do in advance is to look for a well-written English language test waiver request sample. It can help you as a guide and to get an idea of how your letter should be written. By using a well-written example, you can ensure your letter is impeccable. Use it as a template and see how the writer constructs catchy phrases to persuade the reader. Also, do not send your waiver letter without revising it first. Read it from end to beginning to catch any mistakes you may have made. This will help you proofread it faster and correct any errors that you may have made on your TOEFL waiver letter. Reading out loud your waiver letter can also help you to edit your text. This is an excellent practice to see if your phrases make sense and if you have written a coherent letter. We make it personalized and check whether it tells your specific story, not just a general one from a template. The expert editing team rectifies all the mistakes. The writers are fully aware of the TOEFL standards and write in a compelling manner leaving no doubt that your English proficiency is not worse than that of other applicants. The most recent examples are followed to compose unique waiver letters for every client. Our rockstar team of professional writers can help you write a compelling English language test waiver sample. Whatever the reason may be, if you need to write a waiver letter, our team is here to help you. Our writers have plenty of experience writing waiver letters, and they will make sure they write an original, well-written, and persuasive letter for you. Our experts will tailor your letter according to your needs so you can be sure it will be personalized. As part of our professional services, we will revise your waiver letter as many times as it is required to ensure it is perfect. We also guarantee you will receive your letter on time. For more helpful hints about the TOEFL waiver letter, contact us now!